Simple, beautiful and elegantly styled 14k gold, Swarovski® crystal, and AAA-Grade round cultured pearl bracelet. A real treasure that is perfect for any occasion. Choose a crystal color for her bracelet, classic clear, her birthstone, or just her favorite color, a personalized touch she will love! Personalized with her professionally engraved name, initial, or monogram makes this a truly one-of-a-kind masterpiece! 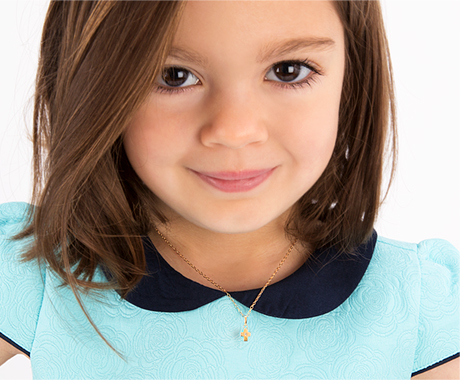 Give your little girl her very first diamond! This tiny charm option is made onto the beaded bracelet strand and becomes a special feature that you will simply adore, and she will treasure forever. (Diamond Details: Carat 0.03, Color Grade GH, Clarity Grade Top SI.) Please Note: "My 1st Diamond" is always strung on bracelet when constructed (like engraved heart,) all other charms will be added on the end ring. See additional images above for examples. Elegant 14k gold bracelet with Swarovski® crystal and real pearls. True heirloom quality you won't find anywhere else!